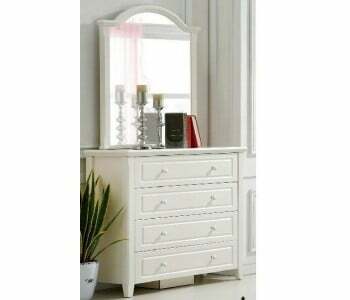 The Villa Marie Antique Mirror Dresser exudes classic sophistication to your bedroom. This stylish dresser features an antique mirror surface supported by a set of chic tapered legs. For added flair, its front and sides flaunt a classic herringbone pattern inlay which gives your bedroom a quintessential old world charm. This dresser comes with four easy-sliding drawers with a metal knob-style handle. Each drawer compartment of this finely-built dresser is spacious enough to store bedroom essentials and personal effects for a streamlined, clutter free room. The Villa Marie is finely built to last. This dresser features high craftsmanship and quality materials, as seen in its sturdy construction and precise mirror inlaying. Combining its gorgeous, charming design, excellent built and function, the Villa Marie Dresser is a great investment choice for your bedroom. All products in stock are eligible for Sydney CBD next day delivery. Ask us if your Villa Marie Antique Mirror 4-drawer Dresser is available now.